Skin tags, warts, vein removal and more. Sudden unexplained bruising or blood spots under the skin or a sudden increase in the frequency of bruising may be caused by a medicine such as aspirin or blood thinners (anticoagulants), or infection that causes the buildup of toxin in the blood or tissues (blood spots under the skin). 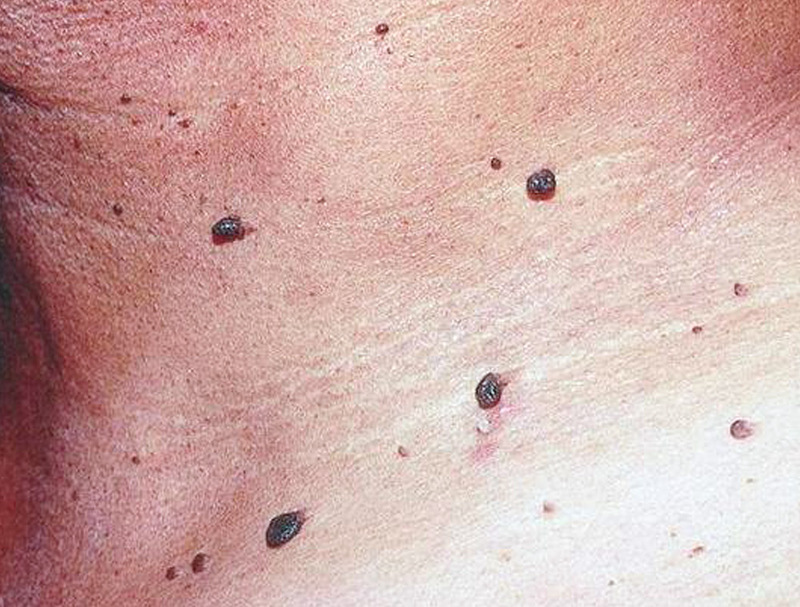 Skin tags (acrochordons) are small flesh-coloured or brown growths that hang off the skin and look a bit like warts. They’re very common and harmless. Skin tags can vary in size from a few millimetres up to 5cm wide. They’re usually found on the neck area, armpits, around the groin, or under the breasts. Warts are skin growths that are caused by the human papillomavirus (HPV). There are more than 60 kinds of HPV, some of which tend to cause warts on the skin. HPV stimulates quick growth of cells on the skin’s outer layer. In most cases, common warts appear on the fingers, near the fingernails, or on the hands. Certain types of HPV can also cause warts to appear in the genital area. Seborrhoeic keratoses are also known as seborrhoeic warts, and as basal cell papillomas. Seborrhoeic keratoses are very common harmless, often pigmented, growths on the skin. Spider or thread veins are extremely common and can be caused by a number of things including hormones, pregnancy, smoking and exposure (varied temperatures). At Clear Skin Clinic, we understand that thread veins can often be a cause of embarrassment. The good news is that we only offer treatments proven to work. IPL technology carefully targets the vein. The light destroys the wall of the thread vein and as a result the vein will gradually and safely disappear. Advanced electrolysis uses small current of electricity to cauterise the problem area on the skin and remove red veins without leaving a scar.